Floral is one of my favorite prints to wear once spring comes around. After long winters full of heavy fabrics & dark colors, I love shedding some layers & wearing patterns that imitate the blooming flowers around me. However, since I consider my style to be more 'casual' and 'edgy' than feminine, I love adding edgy touches to my floral prints to make my outfits look a bit tough as opposed to super girly. Add unexpected accessories - Rather than adding a ladylike or girly sandal to this spring dress, I went the opposite route & wore my Michael Kors sandals with thick straps & tons of buckle details. The juxtaposition of a girly print, like floral, with tough accessories like strappy heels or some bold jewelry, not only dresses down the look as a whole, but also adds edgy vibes to an otherwise girly outfit. Add a leather jacket - Like I did today, adding a leather jacket makes any outfit tougher, but it especially works when you contrast your leather jacket with girly, twirly, floral dresses. Again, not only does adding a leather jacket to a floral dress change up the overall look of your outfit, but it also makes it totally modern. In a day & age where athleisure has become the norm, outfits that have a bit of that 'I-just-threw-this-on' vibe are right on trend. 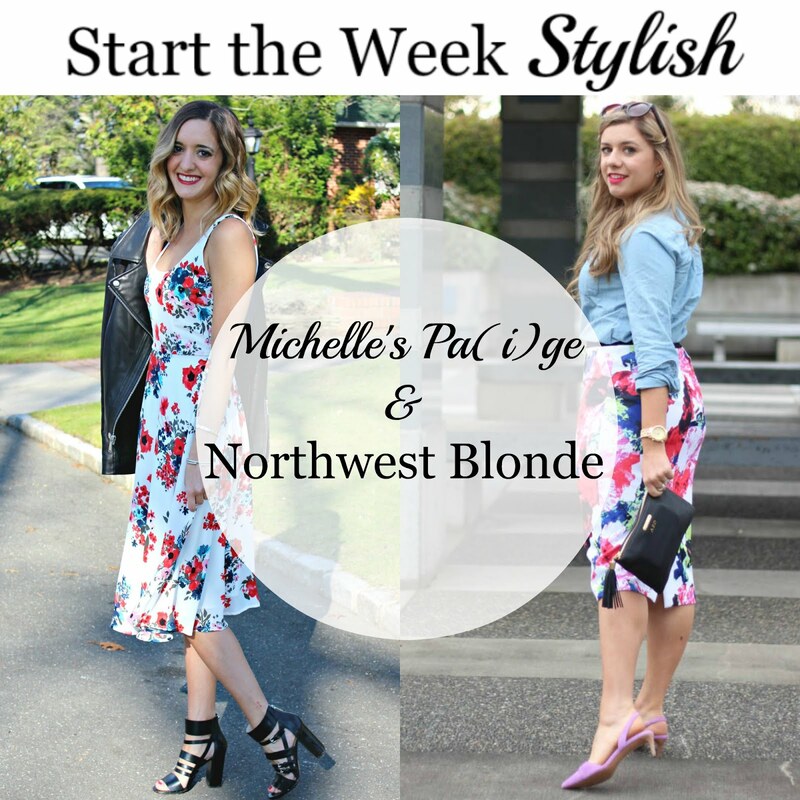 Meet this week's Start The Week Stylish co-host: Amy from My Life From Home. Amy is an Ohio based lifestyle blogger and mom of 3 who uses her blog to share affordable fashion finds, home decor tips, holiday crafting ideas & recipes. Be sure to stop by her blog this week and say hello! 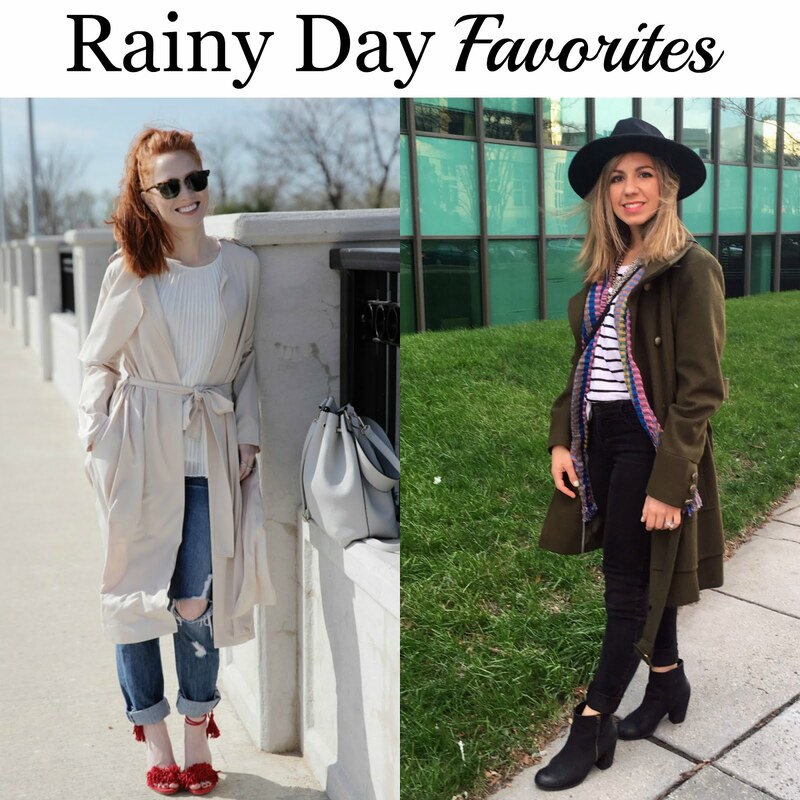 Last week, we loved Adriele from Style Assisted & Roxanne from Glass of Glam's rainy day outfits. This post is done in partnership with Shopbop. All thoughts/opinions are my own. Love the mix of sweet & tough in one look! Come check out my latest collab with Express and let me know what you think – Happy Monday! Can't wait to see it :) Express is one of my favorites! I love your dress and jacket together!! Chic and edgy! Ummm I'm obsessed with this floral print. I love the white background. Perfect with your leather jacket. Cupcakes & Cashmere is FULL of girly pieces. I love the line! Lovely dress, beautiful prints! Love how you combined it with the leather jacket and heels! Ooo, I love the mix of floral with the leather! Mixing edgy pieces with feminine ones is my absolute fave - matches my personality for sure, haha! Me too! I never like to look too girly or too edgy, but mixing up both is perfect! Great tips! I love those shoes! I'm with you - sometimes florals need a little edge! I LOVED how you styled this dress. Thank you for hosting the linkup and I am SO HONORED to be one of your picks from last week! Thank you so much! We loved your look & your tips from last week! What a lovely combination- edge and feminine. I am still looking for my ideal leather jacket. BCBG is expensive, but I love this one! The shape & details are classic moto. Thank you - so glad you found this post helpful! It was such a fun dress to wear - it will surely be on repeat all summer. I love the bit of edge a leather jacket can add to any look! That floral dress is gorgeous on you! Great combo your fantastic jacket and lovely dress! Love this floral print and also how u made it edgy with leather and the shoes! That is a beautiful dress and I love how you styled with your leather jacket and shoes! I love this floral dress on you, and how you paired it with the leather jacket! I'm a big fan of mixing girlie and edgy pieces! Me too - the contrast balances out nicely! Love this feminine dress with the edgy jacket! You look stunning and dying over those sandals! This is such a perfect edgy look! The jacket and boots combo look great with the floral print! love the floral and leather combo ... especially a brightly colored floral. please consider adding your post to my Powers the Flower link-up. Totally swooning over this dress, the length of it is amazing and the pattern is so fun! The midi length adds an extra feminine twist on this floral print. I always love a mix of feminine with an edge! Love the mix of soft and hard with this look! Love your whole look! pretty ! Oh the print on that floral dress is AH-MAZING! I love the subtle blue and red -- so delicate and yet modern at the same time! And those sandals are TO DIE FOR! Love florals right now- everything is blooming, why your clothing, too? You look lovely, lady! LOL of course! Just in time for spring! Oh wow! That dress is so gorgeous! Love the pattern and style. Looks beautiful on you :) Also, great pictures! Thank you ! This dress was lots of fun to wear & photograph!